Melissa Parkin's Blog: Movie Review: "13 Hours: The Secret Soldiers of Benghazi"
Movie Review: "13 Hours: The Secret Soldiers of Benghazi"
Michael Bay’s “13 Hours: The Secret Soldiers of Benghazi” tells the harrowing true story surrounding the Islamic militant attacks placed against the U.S. Consulate in Benghazi, Libya on September 11, 2012. At the time of the coordinated assault, the city has been deemed as one of the most dangerous places on Earth. As a result, all countries, with the exception of the United States, evacuate their embassies in the region owing to the threat of militant attacks. An off the books U.S. consulate, called the Annex, also remains, protected by a team of six former military members turned CIA security contractors. U.S. Ambassador to Libya J. Christopher Stevens arrives in Benghazi with the hopes of reassuring peace in the city by holding a press conference. With an understaffed protection detail and local pro-American militia safeguarding the Ambassador, the Annex team, stationed only a mile from the Consulate, is brought in as Stevens’ drivers and backup security. On the morning of the September 11th anniversary, suspicious behavior is spotted outside the compound. Come nightfall, a group of Islamic militants overrun the Consulate, forcing the guards to take Stevens and United States IT personnel Sean Smith into a safe room. Overwhelmed as the radicals set the building ablaze, the security detail radios the Annex team in desperation for them to come to the rescue. Locked and loaded, the contractors (James Badge Dale, John Krasinski, Dominic Fumusa, Max Martini, David Denman, and Pablo Schreiber) await the order, but ultimately hit a wall when their chief rejects the petition out of fear of redirecting the militants to attack the CIA Annex. Defying the demand to stand down, the outnumbered contractors bravely dispatch to the Consulate in hopes of rescuing their fellow countrymen. After the melodramatic disaster that was Pearl Harbor, having Michael Bay at the helm of another real life war film should only inspire eye rolls and aggravated moans. His movies are notorious for their overindulgence of unnecessary detonations, pyrotechnic explosions, shaky-cam, and style-over-substance storytelling. Film buffs have even scathingly deemed these gratuitous trademarks as “Michael Bay-isms”. With powerful, modern-day war films like American Sniper, Lone Survivor, and Zero Dark Thirty placed in the hands of critically acclaimed directors, Bay’s undertaking only seems all the more problematic. In truth, it’s cringe-worthy, and you haven’t even taken a seat in the theater. On the surface, “13 Hours” seems to play into all the archetypes seen in virtually every other American war film, right up to the pregnant wife at home. Given that this is based on the book of the same title by Mitchell Zuckoff and the actual Annex Security Team, it throws into sharp relief that these instances are in fact reality for our servicemen. What the film notably strays from, for better or for worse (depending on the viewer), is outright endorsing any political affiliations. It focuses solely on the intrepid ex-military men who combated wave after wave of militia fire. The runtime leading up to the attack does lag in some scenes, but once the going gets tough, the pacing is positively breathless. The acting is superb, the fights are well choreographed, and even Bay manages to impress, proving he’s far more capable guiding actors than CGI robots. Some might not appreciate certain filming choices, particularly his use of shaky-cam. Thankfully, the techniques are still tolerable, and in some ways, they add to the grit of the narrative. It’s easily Bay’s best movie since 1996’s The Rock, and it’s elevated by a soaring score by renowned composer Hans Zimmer. The film does comes out at a time when its subject matter is at the height of political controversy, but its likeliness to sway the public’s opinion one way or the other isn’t too great. What “13 Hours” does achieve is stirring our appreciation for the servicemen and women who brave these battles against impossible odds. 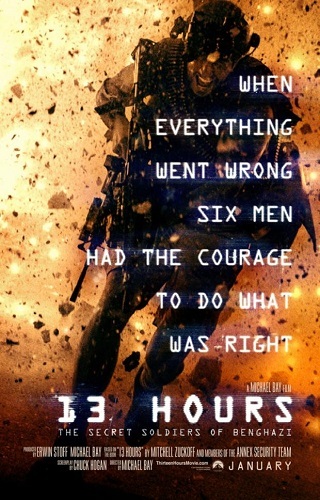 "13 Hours poster" by Source. Licensed under Fair use via Wikipedia.